How much do you like baby raccoons? Are you among the many who love them? Or do you see them as pests to be avoided at all costs? Not many animals in the United States prompt such a wide range of feelings and reactions. Either you love raccoons or you hate them. One thing’s for sure: Everyone can agree where baby raccoons are concerned. They are among the cutest baby animals. They’ll melt your heart and dispel any negative feelings you may have about their parents. But if baby raccoons are inside your chimney, you can’t be ruled by your feelings. The babies need to be removed quickly and, of course, without hurting them. Let's consider why baby raccoons might be in your chimney and the best practices for humane removal. Your chimney is a fantastic place for a raccoon to make a den. Aside from seeing a suitable spot to settle down, the main reason the raccoon decided to enter your chimney is that you invited the animal in. How is that possible, you may wonder, when you didn't even know you had a house guest? Well, it is possible if you did nothing to keep raccoons away. Your chimney was not properly protected, making it very easy for the critters to settle inside. We’ll talk more about protecting your chimney later. We said your chimney makes a perfect den for a raccoon. This is so for several reasons. First, if there is anything that a raccoon cannot stand, it is wasting time preparing a den. Your chimney is readily available in seconds. The raccoon just needs to enter, climb down to the bottom and make herself comfortable, and the den is set. The bottom of your chimney is darker than any hole in a tree. The heating system in your house makes the chimney warmer than a tree in the forest. The depth of the flue makes the raccoon feel totally safe and protected from predators. The size of the chimney is ideal to prepare a comfy litter to raise baby raccoons safely. Simply give the raccoon a chance to visit your chimney and you will have a new tenant in your house. She will not pay you a monthly rent, but she will certainly cost you money. Many people believe that raccoons in the chimney fell in and just need help getting back out. This is entirely wrong since raccoons are excellent climbers and can get in and out of your chimney quickly. Baby raccoons, however, are not able to climb until they are big enough. As we will explain later, even if the mother may be forced to leave the chimney, baby raccoons need special attention to ensure they’re removed correctly. When Do Raccoons Have Babies In The Chimney? When a raccoon picks your chimney as her new den, she is almost certainly a female raccoon about to give birth to babies. In fact, another reason a raccoon finds the flue to be a suitable den is because it offers excellent protection from male raccoons. 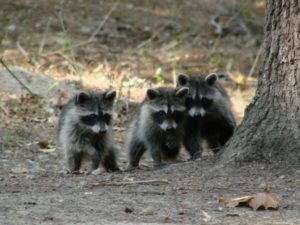 Males have a bad reputation for killing baby raccoons in order to mate again. Inside the chimney, the mother can easily keep males at bay. When raccoons have babies is an important factor to understand so that you know when during the year you need to be more alert. The raccoons’ breeding season usually goes from February to May. It may slightly vary depending on region and climate, but more or less this is the time when females give birth to baby raccoons. During this period, a female raccoon starts to roam around looking for a location that is safe, warm, dry and close to sources of food and water. Your chimney meets all those requirements. Once she enters, she will climb down to just above the fireplace where the damper is. The damper will be used as the base to prepare the nursery that will host the baby raccoons. How Do You Know If You Have Baby Raccoons In Your Chimney? Figuring out that something is going on inside your chimney is not difficult. The shape of the flue amplifies even little noises. You will most likely hear the noises at dusk or during the night when the raccoon is in action providing food and taking care of her cubs. When you hear noises coming from the chimney, you need to understand what kind of animal is inside. The acoustics of the chimney may be misleading, and even squirrels can sound like large animals. But if you spot a raccoon in your yard or on the roof, if you have found raccoon droppings around your house, or if your trash can is regularly raided, you probably have a raccoon living in your chimney. When it comes raccoon problems, having one inside your chimney is one of the best scenarios. Removing the animal from the chimney is easier than removing a raccoon from inside the attic or a wall. Most important, inside the flue the raccoon cannot cause significant damage. She will not find cables or water pipes to chew up, nor does she has insulation to tear apart. To a certain extent, the rest of your house is safe. But that should not make you think you can remove the animal without much effort. Moreover, what may look like an easy solution may only lead to further problems. Opening the damper. That may appear to be an easy fix, but it is not. Once you open the damper, the raccoons will fall right inside your house. As a result, you may find yourself with several baby raccoons running around inside your home and maybe disappearing into crawl spaces. This is a scenario that you need to avoid. If the mother is inside the chimney when you open the damper, you may even confront an angry raccoon. Messing around with the cubs makes the mother highly upset. If she also feels trapped inside your house, she may become aggressive and attack you. Since raccoons are rabies carriers, you must avoid being bitten or scratched. If you find yourself in this situation, create an escape path by opening doors and windows, and do not attempt to corner the raccoon. Smoking them out. This is another evergreen solution in the DIY world. The idea is that you start a fire, and the smoke and heat will scare away the raccoon. Wrong. Even if that’s true for the mother, the baby raccoons cannot climb the chimney. With a fire threatening, the mother does not have time to relocate the baby raccoons either. You will end up cruelly burning alive the baby raccoons, leaving dead bodies in the chimney that will have to be removed. Additionally, to start a fire you need to open the damper. Doing so may lead to the problems mentioned in the previous point. In the end, trying to smoke out the raccoons won’t do you or the raccoons any good. Trapping the mother out. There are several ways to force a raccoon out of your chimney. You may try to scare her using a pole. Repellents, highly ineffective elsewhere, can work quite well in a chimney due to the confined space. You may even wait until dusk when the mother leaves looking for food and then trap her out. All of these solutions, once again, don’t take into consideration the baby raccoons. Left inside the chimney, the baby raccoons will starve to death, and their rotting bodies will fill your house with a revolting smell. Besides not being healthy for your home, dead raccoons will be expensive to remove. If the methods we just considered are all ineffective and inhumane for baby raccoons, following the right procedure will solve your problem without causing further inconvenience for both you and the cubs. Trap the adult raccoon. This is always the first step to take. If you try to reach the baby raccoons when the mother is around, the mother will become upset. It is not uncommon for a raccoon to attack humans in an attempt to protect her cubs, and an angry raccoon is not easy to handle. A bite or a scratch from an adult raccoon can even expose you to rabies, a risk that you do not want to take. There are several options for trapping an adult raccoon in your chimney. Some people use repellents to annoy the raccoon and force her out. Since the flue is narrow and with the damper closed there is no ventilation, repellents may prove effective. Another option is to use a pole-and-trap system to snare the raccoon. This method requires skill to maneuver the pole down the chimney and target the raccoon in such a dark, tight space. Snaring is also not a pleasant experience for the raccoon, who will no doubt make all her frustrations apparent during the process. Additionally, you can wait until the mother leaves to look for food and then install some kind of protection on your chimney to lock her out. The method we prefer for its effectiveness and low impact on the animal is trapping. Ideally, the trap will be firmly secured at the top of the chimney. Once the mother goes out looking for food, she will end up directly in the trap. Easy and safe. No shocking experiences for the critter and a great result for you. Otherwise, the trap can be placed on the roof or in the yard, wherever you believe the animal is coming out of the chimney or off the roof. This option may work, but it is not as successful as setting the trap right on top of the chimney. Outside, you have a greater chance of trapping other animals or a raccoon that is not the one living in your flue. Remove all the baby raccoons. Once the mother is out of the game, removing the baby raccoons is not a major problem. You may have newborn raccoons or young raccoons. In either case, they are not very dangerous, but you should still use leather gloves to protect yourself. Even at a young age, the innocent-looking cubs can bite and their claws can easily scratch your skin. Since the chimney is not the most comfortable place to poke around in, it is a good idea to use a mirror to carefully inspect the area above the damper to see if there are newborn raccoons left. If some of them are difficult to reach, you may use a snaring pole to trap them, but always be careful not to harm the little creatures. During the removal, make sure you have a pillowcase or a box next to you in which to put the baby raccoons. Family reunion. The newborn raccoons cannot survive without the mother. After all your efforts to humanely remove them, you definitely don’t want them to die because the mother cannot feed them. The next step, then, is to reunite the baby raccoons with their mother. How to go about the reunion depends on the method you used to trap the adult. If the adult is inside a cage, just put the baby raccoons in the same cage and then release them together or take them to a rehabber, depending on local regulations. If you trapped only the baby raccoons, put them inside a box and place them in the yard where the mother can easily reach them. A mother raccoon never abandons her cubs, and she will come back to rescue them. Leaving the baby raccoons inside the box allows the mother to get them one by one and relocate them to a safer location. Finally, your house is free, the raccoons are out, and you can sleep without annoying noises coming from the chimney. However, you still have some work to do. Even if the raccoons are now gone, it doesn’t mean that a new one will not move in. A place that has already been used as a den by a raccoon has a higher chance of being used again by another animal. The first step is to install a sturdy steel chimney cap. This preventive measure is generally enough to keep raccoons away from your flue. In rare cases, a raccoon may find a way into your chimney even if the cap has been installed. This is a clear indication that the flue is damaged somewhere, allowing the raccoon to enter through a hole. If this is your case, carefully inspect your chimney and promptly repair any damaged areas you spot. A word of caution when you decide which steel cap to install: Check on the ventilation rate required in your area. Some steel chimney caps may excessively obstruct the flue. Consulting a specialist may be advisable to keep your house safe and up to code. There is another thing to consider. After raccoons have been living in your chimney for a while, the area is now contaminated by their droppings. The droppings need to be cleaned up before you light the fireplace. Remember that raccoon droppings are highly dangerous to human health and need to be handled with caution to avoid possible contamination. Should You Hire A Wildlife Specialist? If you have raccoons inside your home and they decide to use the chimney as a den, you are pretty lucky. Removing the adult and the baby raccoons from the chimney is relatively easy and the damage they may cause is very limited. Nevertheless, when you deal with wildlife, no two jobs are alike. There are always variables and unforeseen circumstances along the way. You may encounter a shy raccoon that leaves easily, or you may face a stubborn one that makes the task daunting and time-consuming. Putting a trap on the chimney and then installing the steel cap both require working at a decent height. You may have to use a ladder or walk on a steep roof, so you need to be extra careful. You also never know how a mother raccoon will react. If you are on a ladder, an unexpected reaction from the raccoon could easily make you lose your balance and cause a serious accident. They have been trained to work at height. They are equipped to trap the adult and baby raccoons without harming them. They know the local regulations about trapping and relocating the animals. They know how to handle raccoon droppings safely and sanitize your house. They can give you the right advice about what kind of steel chimney cap to install. Most important, a wildlife specialist will assist you in making your house raccoon-proof to avoid another intrusion, especially one in a more exposed and damage-prone area like your attic. A specialist like Get Raccoons Out will tell you how to correctly file a claim with your insurance company so that any damages will be covered. As you can see, there are so many reasons to hire a wildlife specialist who will fix your problem for good and avoid complications. If you have baby raccoons living in your chimney, you can contact Get Raccoons Out, and our raccoon removal specialist will promptly get in touch with you for a free estimate.